Terraced Garden began in early '81 as a solo project by Toronto-born multi-instrumentalist/composer Carl Tafel. Prior to this, he was one third of a band called Cardboard Brains, for whom he played bass and sang, a "demonically heavy" outfit, by Tafel's own admission, that was "too far outside for any broad acceptance." He left the band in order to concentrate on writing, playing guitar and keyboards, and developing a more expanded sound. The first recordings began in 1981, but the money quickly ran out. A year later, Tafel went back into the studio, and with the help of some other musicians, finished the recordings for the first album by the end of 1982, and it was finally released in January '83. A powerful debut, Melody & Menace succeeds in grafting the expletives and dynamics of the progressive rock idiom into the short song format without stooping to commercialism or ascending to the pretentiousness that so many prog bands fall into. 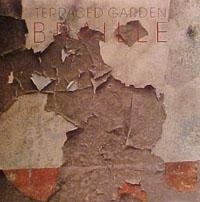 Not a small feat by any measure; Terraced Garden's music is honest, and doesn't seek comparison. Of course, the driving force is Tafel's compositions, which seem to fall into two categories. The first is an acoustic guitar driven rock of varying intensity, generally fronted by brilliant (and I must say unique) multi-part harmonies, excellent lyrics, and supported by keys, flutes, Mellotron, violin, more guitars, and a rhythm section that backs the effort well. It's that combination of harmonies and violin that more than occasionally reminds me of the late-60's edition of It's A Beautiful Day. Tracks like "Black Tie" and "Old Friends" are examples of this style, but perhaps the finest example on the album is "Passages". The other side of TG is an edgy, electric guitar based rock - a swirling cauldron of chaotic and understated melodies, backed up by a strong rhythmic presence, perhaps residing somewhere along the axis between mid-70's Crimson, and (if there were such a thing) progressive punk - typified by tracks like "Threnody", "Coventry", and "Noise and Haste", all of which are completely instrumental. Indeed, Tafel's soloing may at times remind of Fripp, with his penchant for infinite sustain and disonnance. "I always felt that was the way my personality was as an individual, and certainly as a writer", explains Tafel. "There were always two sides - the more melodic side that was pretty and nice to listen to, and another one that was more sinister and menacing. I always thought they were both fairly valid, and I certainly felt both of them, but playing live I think the menacing side would come out a little more." On "Creature of Habit", the two extremes of the Terraced Garden 'sound' are pulled together and blended, which in fact points in the direction they would travel on later releases. Tafel notes of drummer Peter Weeks: "I'd worked with him in a previous band and he was a great drummer. What I didn't realize when I asked him to drum on the album is that he was in the process of selling his kit! He certainly drummed well, but he could have drummed a lot better had circumstances been different. To his credit, he didn't really have a chance to become familiar with the songs, and he did a very credible job with them considering that I didn't even know what direction I wanted them to go. Some of his tracks are just very basic [click tracks] so that I could finish the rest of my parts - I guess "Dry Leaves in the Wind" was one of those. I think if we'd had more time, and certainly if we'd had more money, we could have worked a few things out better to his credit. There was a killer track he did for "Threnody", but there was something screwed up with the miking - but man, if you could've heard that, it was amazing! And he didn't have a kit, we had this crummy rental kit, that was frustrating. But I couldn't have done that first album without him." Of drummer Phil Dewhurst: "'Noise and Haste' was kind of an afterthought for the first album because I'd run out of money, and so a year later I went back in and wanted to record it. There was another song called 'Barren Ground', it was a good song, long and complicated, about eight minutes. But I didn't think I could do it justice [given the budget I had]. So I felt 'Noise and Haste' was a better song. I liked Phil's drumming - I'd heard him with some other bands, and he did a great job especially considering that he really hadn't rehearsed with me live before going in to record it." After the release of the album, Tafel put together the first live version of the band, which featured Darrell Flint on bass (ex-Cardboard Brains), Scott Weber on drums, and Jody Mitchell on guitar, with Tafel on guitar, keyboards, and vocals. "The album came out around Christmas, and I put a band together in January because I had to. There was really no other reason to get a band going" he recalls. "I used to gig to tapes. I'd mix tracks out from the studio and I would play those tracks live. I used to bring a bass on a stand and a guitar on a stand, and switch from one to the other, and sing harmonies sometimes. It got kind of ridiculous after a while, and there's only so far you can go with it. I needed to put a live band together. If you're going to put out an album, you may as well try to support it. I'd known Darrell for some time. He had played with Cardboard Brains, but he played with a different version of the band after I left. Scott was a friend of his. Jody Mitchell was a guy I knew, he was a guitar player. I was still mainly playing guitar, but I was doubling on keyboards and singing. I just kind of got the guys together and taught them all the parts." They worked a few months as a four piece, but then added Simon Jacobs on violin who had played on the album, allowing them to offer more faithful renditions of the album material. "Simon was available. I'd met him at a party while I was in the process of recording the first album. He came in and played some parts, he was a very good player. At first we thought we would just use him for a couple of 'showcase gigs', but things seemed to work out and he became a permanent member." During their shows, they would switch instruments regularly. Jacobs was proficient on both violin and keyboards, Mitchell on guitar and keyboards, and Flint and Tafel could both handle guitar, bass and keyboards. "I think the people in the audience found that unusual, and appreciated us more for it". At the start things weren't easy. They played the worst possible nights at the worst clubs, but over time they started building a following, and before long it was better nights at better venues. By the close of '83 things were happening. New material had been written and performed live, and it was time think about recording a second album. They went into the studio in February '84, and the album was released in June of that year. With Braille, the compositional extremes became more integrated and a bit more sophisticated as well. Because the album was recorded essentially by the five-piece live band who'd been playing together well over a year, it seems far more cohesive than the debut. At the same time it has a distinctly darker flavor about it, with the track "Internment" perhaps being the most striking example of this. The musical extremes of the first album are approached at several points ("Versailles" for the overt harmony-laden guitar driven side, "Structural Damage" representing the harder edge) but for the most part the band's two sides are blended well and carry forward to find some new territory as well. Tracks like "Winter", "Delusions of Grandeur" and "Blobo" stake out new claims that would later be followed up and refined on the third album. Overall, Braille seems to be far more of a band effort than it's predecessor. Tafel explains it this way: "We went in with a rhythm section who were used to playing the songs live - Darrell, Scott, and myself. We ghosted my tracks and put the rhythm track down in the first two days, then everyone left and I finished the rest of the parts. So it's still basically a solo project, except for "Empty Beach" which Jody wrote and presented to the band, I wrote a melody line and everyone else put in their parts. Jody put the guitar lines down the first day in the studio, but didn't get a chance to hear the rest. By the time it was finished it was radically different than the way it started out. Jody was horrified initially, but liked it after hearing it a few times. I'll give him credit, he wrote a good song, and I think the band did a nice job with it. There were a number of other songs that were played live - one by Jody, one by Simon, one by Darrell, and about four or five of my own that were never recorded. With the exception of "Versailles" and the end of "Structural Damage" - as well as "Patience" on the third album, I wrote all the bass lines, but I'll certainly give Darrell credit because he took those lines and played them much more like a bass player, improving upon them by adding little nuances that made them sound better. It was easier to go into the studio and have bass and drums play alongside what I was doing, rather than having everything happen one track at a time." A single of "Blobo" and "Empty Beach" was also produced and distributed as a promotional item but was not generally available, given away to people who came to the clubs, to encourage them to buy the albums. There was also a promotional single off the first album of "Passages" and "Noise and Haste". After the release of Braille, gigging continued for some period of time, but by mid-'85, due to general apathy and discouragement, the live version of the band disbanded. Meanwhile Tafel continued writing new material for a third album. "We'd reached the point where we thought something was going to happen with the band, and then everything started to slow down. We were getting mostly weekend gigs by that time, and most of the A&R guys from the record companies don't want to be bothered on the weekends, regrettable because we did have a sizeable following. Everybody in the band had hoped that we would be able to go further with it. When you look back to '85, the climate really wasn't very good - certainly in Toronto, but I think in all of North America, to have an all-original progressive rock band. There were lots of clubs with live music, but there wasn't anyone doing what we were doing. It had reached the point where we weren't really going to go any further in Toronto, and there was a lot of dissatisfaction about that within the band, so in the end I just let it die." Tafel's regular business as a gardener had expanded, thus leaving only about four months of the year to devote to music. By mid-1986 he was ready to start recording the third album. At that point, the players were Darrell Flint (bass), Garry Flint (drums), Simon Jacobs (violin), with Tafel playing everything else. Work on that album continued intermittently for over two-and a half years, and was finally completed by late '88. Around this time, Tafel formed a new five-piece live band (which included Darrell Flint from the studio lineup and three new members, Craig Flint - keyboards, Mark McLay - guitar, and Rob Falko - drums). Of this live band: "Mark was kind of a heavy-metal guitar player, which in a way was a nice addition, it was certainly a different direction for the band. Some people didn't like it, but quite a few people did." The album was finally released in March '89. As the fruition of eight years of writing and recording, Within probably stands stronger than any of the Terraced Garden albums to that point in time. A more mature compositional approach is evident on almost every track, as well as more attention given to arrangements. The best elements of the first two albums are here, plus a lot more. Like the others, it's a completely honest and unpretentious album, there are no obvious attempts to 'be progressive'; Tafel and co. do what they do natuarally, and it just turns out that way. The track "Forty Days" stands as the pinnacle of the Terraced Garden vocal-harmony driven, acoustic guitar-based approach, even surpassing "Passages" (from the first album). "Holding A Torch" and "Patience" offer a somewhat-more electrified approach to a similar style, the former driven by Jacobs' LaFlamme like violin melodics. "Apparatus" and "Moron Children" fill the hard edged slots at the end of each side, the opening section to the latter possibly being the best example of the raw power this band can pack. "Walking Wounded" brings that edgy sound into a song context, with an almost-punk urgency. Overall, Within represents the refinement of all that Terraced Garden had done to date, and is probably the best and most accessible of the three. "I quite like the third album" Tafel explains. "It was nice to spend a longer period of time writing the songs and arranging them. I don't like the second album as much - one of the problems is that I wasn't that keen on the drummer and I didn't like his sound. I wouldn't mind remixing Braille. I would certainly mix the drums down. I guess it was an 80's type of thing, where the drums are further up in the mix, but I wish I hadn't listened to some other people's advice, because I think they take away from a lot of the other instruments." "It was great on the third album. Garry was the best drummer I had worked with. As far as drummers go, I've always been appreciative of what they've been able to add to my music. Certainly on the third album I had a better idea of the rhythmic direction, so it was easier for Garry to work with it. I got together with him and Darrell and we only rehearsed maybe four or five times for that album. I knew he was a good enough drummer that he would grasp it quickly. He did a great job, especially when you listen to stuff like "Moron Children" and "Apparatus". We went in with a rhythm section - a Saturday and a Sunday, and they were finished. I wished I could have worked with Garry live, but when we got the live band together he had other commitments." Response to the third album and ensuing live shows was favorable, and despite that it was only released on vinyl at a time when that format was rapidly being replaced by the compact disc, the album sold surprisingly well. "It seems sort of a shame that the hardware and software changed at the time the last album came out". Indeed, at the time there were no places to have CDs independently manufactured in Canada. "I wish I would have had more foresight and put it out on CD as opposed to vinyl" he adds. This live edition of the band lasted a little less than a year, after which Tafel returned to writing new material. "The same roadblocks again. None of us were making any money, and then Darrell had an apparent opportunity to go and do some recording in the Bahamas, so I split up the band." In general, playing live was never quite as fulfilling as the studio work, according to Tafel. "Primarily I like doing albums and writing songs. There's something really neat when it's written, arranged, and recorded. To some degree, playing it live was always a bit of a chore because I already knew the songs and the arrangements, and I had to teach them to everyone else, and then rehearse and play them into the ground until we could get them tight enough to perform live. There's an awful lot of work involved, too - moving equipment, putting up posters, dealing with management. But we had some pretty powerful songs, and there were certainly enough nights when we were up there on stage when I had to think it was very cool to be there playing in front of an audience". He adds "I always thought we had some strong material, and if people only had a chance to hear it, they might have really liked it. But so few had a chance. I would have loved to have been a little more successful, and I certainly would have been able to cut a hell of a lot less lawns to support myself."